The Most Excellent Grand Superintendent joins with all Companions of the Province in offering warm fraternal congratulations to those Companions to be Reappointed, Promoted and Appointed in Supreme Grand Chapter; at the Installation Convocation, to be held on Thursday 25th April 2019. The Right Worshipful Provincial Grand Master and Most Excellent Grand Superintendent will each host a Luncheon in honour of those Brethren and Companions who have been Appointed to and Promoted in Grand Rank. The Most Excellent Grand Superintendent in and over the Masonic Province of South Wales was pleased to Appoint, Obligate and Invest E.Comp. Colin Hugh Thomas, OStJ, PGStB as Deputy Grand Superintendent and E.Comp. Phillip Anthony Aubrey, PGStB as Third Provincial Grand Principal and Appoint and Invest E.Comp. Ben Gait as ProvGSE, at the Regular Convocation of Lord Swansea Chapter No. 8364 on Friday 8th February 2019. At the same Convocation, the Most Excellent Grand Superintendent was Elected to serve as First Principal of the Chapter and will therefore be Installed as First Principal of both Hendre Chapter and Lord Swansea Chapter in 2019. The Association of Friends of the Albert Edward Prince of Wales Court held a luncheon for the Friends and their wives or partners on Sunday 20th January 2019, during which the Chairman, W.Bro. Alan Gardener, PSGD, Assistant Provincial Grand Master, announced his intention to stand down from the role with immediate effect. Brother Gardener has served the Association of Friends with distinction for nearly eight years and his contribution to the success of the Association of Friends will be felt by all who come into contact with the Home for many years to come. At the same meeting it was announced that W.Bro. Phillip A. Aubrey, PAGDC will assume the Chairmanship with immediate effect. W.Bro. Gherold M. Davies, PPrGSwdB has been appointed to the role of Vice-Chairman. The 17th Regular Convocation of Lord Swansea Chapter No. 8364 will be held at the Masonic Temple, Swansea on Friday 8th February 2019 at 5.30pm. Appoint, Obligate and Invest E.Comp. Colin Hugh Thomas, OStJ, PGStB as Deputy Grand Superintendent. 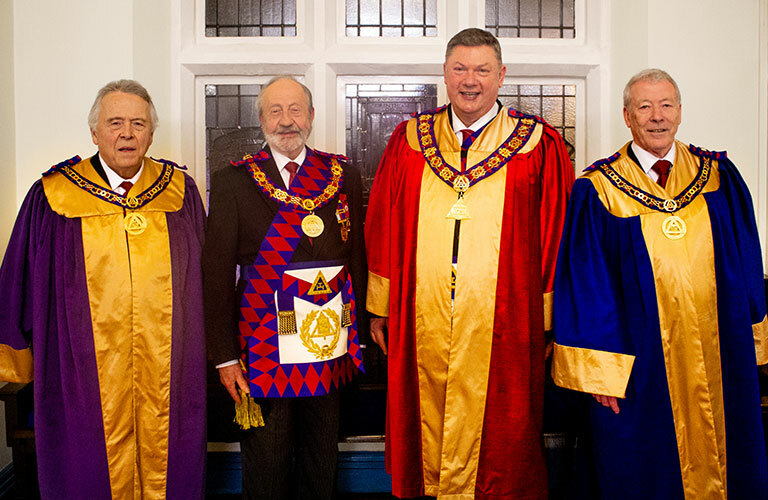 Download the Lord Swansea Chapter Summons for 08/02/19 here. Download the Dining Reservation form here. The attached dining slip, which should be returned as directed no later than Friday 1st February (but preferably before). The Right Worshipful Provincial Grand Master has reluctantly accepted the decision of V.W.Bro. H.E. Roy Woodward, PGSwdB to retire from the high office of Deputy Provincial Grand Master, with effect from 31st December 2018. Brother Woodward has served our Province with great distinction as our Deputy for over 5 years and at Executive level for many years before that, and his leadership and wise counsel will be greatly missed. In consequence, the Right Worshipful Provincial Grand Master will be pleased to appoint W.Bro. William E. Jenkins, PSGD to succeed Brother Woodward as Deputy Provincial Grand Master. The Deputy Provincial Grand Master Designate will be appointed and invested at the regular meeting of Hendre Lodge No. 3250 in Cardiff Masonic Hall on Thursday, 24th January 2019. Following the Deputy Grand Superintendent’s appointment as Deputy Provincial Grand Master, the Most Excellent Grand Superintendent is pleased to announce that E.Comp. C. Hugh Thomas, OStJ, PGStB, Third Provincial Grand Principal will succeed Companion Jenkins in that high office. E.Comp. Phillip A. Aubrey, PGStB, ProvGSE will succeed Companion Thomas as Third Provincial Grand Principal. The Deputy Grand Superintendent Designate and Third Provincial Grand Principal Designate will be appointed and invested by the Most Excellent Grand Superintendent at the regular meeting of Lord Swansea Chapter No. 8364 in Swansea Masonic Hall on Friday, 8th February 2019. As a result of Companion Aubrey’s appointment to the Royal Arch Executive, the Provincial Grand Master and Grand Superintendent have decided to appoint W.Bro. and E.Comp. Ben Gait ProvAGSec/PPrAGSE to the roles of Provincial Grand Secretary and Provincial Grand Scribe E. Brother Gait will be appointed to the former role at Hendre Lodge and to the latter at Lord Swansea Chapter. In the Autumn edition of Freemasonry Today, Assistant Grand Master and Chairman of the Improvement Delivery Group Sir David Wooton explained how a new online service will allow members to access the learning resources necessary to enjoy Freemasonry to the full. The requirement to learn ritual by rote and then present it without any attempt at providing the most basic of context and understanding fails the candidate, because it overlooks the important messages that lie within. Member surveys have also highlighted learning as a major unmet need and a potential reason why members leave. The new online service is Solomon – an accessible searchable repository of ‘Nuggets’, presentations, papers, demonstrations and quizzes to stimulate interest and meet current and future needs. It also offers practical guidance for lodges and chapters to plan and deliver learning materials. It will see its official launch at the Quarterly Communication of UGLE on 12th December. You can submit a news story by email to the newsdesk here. Subscribe to our newsletter that sends good, or special news from throughout the Province, on Masonic and non-Masonic occasions. And it's FREE!